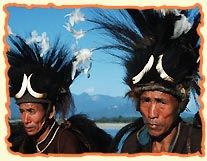 The tribal tour of India now reaches Arunachal Pradesh and we discuss Khamtis tribes of India. Kham-Tai, Hkamti, Khampti, Khamti Shan, Khantis and Tai Kam Ti, are some of the other famous names of these Indian tribes. These tribes are generally found in parts of Assam, Arunachal Pradesh and parts of Myanmar. Labels: indian tribes, khamtis tribe, tribal tour of india, tribes of india.